About 12 years ago, the Seventh Circuit decided Outsource Int'l v. Barton, one of only a handful of employee non-compete cases it has heard. The case arose in the staffing industry and involved a fairly limited customer non-solicitation covenant and a 25-mile non-compete. As with many non-compete disputes, the case centered on reasonableness - not actual breach, because there was not dispute Barton did. The Seventh Circuit affirmed the district court's grant of injunctive relief, which prompted a dissent from Judge Richard A. Posner who remarked that Illinois courts would not enforce Barton's non-compete. The dissenting opinion was interesting in the sense that Posner agreed with the outcome, at least in terms of whether the result was substantively fair, but disagreed with the application of the law. He felt that Illinois courts were too hostile to the contract to enforce it, particularly under the then-applicable legitimate business interest test. The dissent prompts me to wonder if Judge Posner would now view courts as hamstrung, given that Reliable Fire Equipment v. Arredondo has replaced the test which he felt doomed the employer's chances in Barton. I think he would now feel that judges were not so constrained. There are a few interesting nuggets from that case, which are great for lawyers to keep in mind. To be certain, Judge Posner believes in the notion of freedom of contract, such that I don't think he views the prevalent reasonableness test as anything but outdated and paternalistic. He would, in my mind, be open to viewing particularly onerous covenants that really don't protect much of anything (say, for a low-level employee with no skills to move customers) as subject to a defense of unconscionability or fraud. I'm not one for affirmative defenses, but perhaps employees need to be thinking about fitting their theory into a traditional contract defense rather than resting on the employer's inability to prove reasonableness. "Duck, Bluff, Weave and Change the Subject"
Those are Judge Posner's words, apparently uttered at the Seventh Circuit Bar Association's annual dinner. Apparently not directed at some of my opponents, they were meant to describe how judges grapple with increasingly complex subjects before them. Judge Posner is sitting as trial judge on an upcoming patent case, so he may be particularly motivated to discuss this topic now. He is an advocate of independent, court-appointed experts to help sift through the battle of retained experts and cut through some of the technical jib-jab at trial. That should do plenty to scare the hell out of lawyers, but it makes sense. In the non-compete world, many covenants are enforced to protect trade secrets - and trade secrets (like patents) can be highly technical. This may be an area district judges explore, particularly in cases involving source code, financial derivatives, or biotechnology. 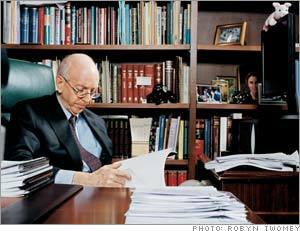 A link to the article on Judge Posner's speech from the Chicago Tribune can be found here.